From 5–10 June, Imperial Square and Cheltenham Town Hall will be filled with free, hands-on fun. Enter a carnival of creativity in the MakerShack, find out about cyber security in the brand new Cyber Zone and find activities of all kinds in our Discover Zone. 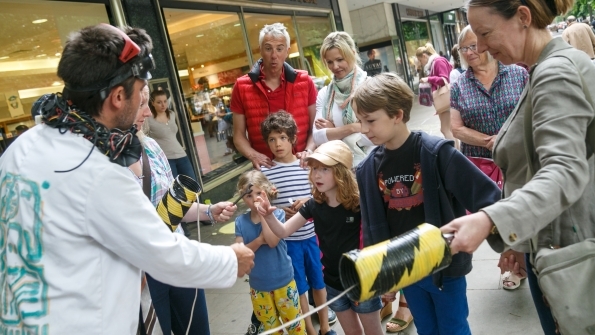 What is more, look out for experiments, hands-on making activities and performances as the Science Festival takes to the streets with even more free events, suitable for all the family. View the #cheltscifest 2018 …around town flyer below or download it here. We’ve worked with Cheltenham Business Improvement District (BID) to make sure that the town’s businesses, from shopping centres to bars, are part of the fun, parading everything Cheltenham has to offer.